One of the lovely things about being a parent is when you see your child trying to copy you because they want to be ‘just like you’. Cherry does this a lot lately, she will copy whatever I am doing then say ‘I’m doing it just like you Mummy’. What she doesn’t realise yet is that she is just like me in a lot of ways, or how I was as a little girl anyway. She’s really sensitive and picks up on emotions and feelings. Mr C and I don’t have big shouting arguments but if ever we are having a disagreement about something she gets really affected by it and will do something like throw her plate of dinner on the floor or be a bit naughty. She also likes to have a little collection of things that she carries around with her at all times, as in she won’t leave the room / house without them and they even sleep in her bed with her. At the moment it is a certain toy and the themed books which go with it (all will be revealed in a minute! ), I have actually had to go into her room at night quite a few times this week and remove four hardback books from underneath her where she has fallen asleep on them. It’s really interesting to see the things she has been born with that are similar to me and the things that she will choose to copy of her own accord to be like me, and Mr C of course. She loves to copy him too. The main way similarity between me as a child and her though is our love of Noddy. The girl is obsessed, as I used to be. It’s all she ever wants to watch, she comes out with lines of the show all the time, she carries the books around, Noddy comes EVERYWHERE with her and since buying her this…. It’s all she wants to wear! I found her all the old Noddy books that I used to have and I love reading them to her and seeing her enjoy them as much as I used to. 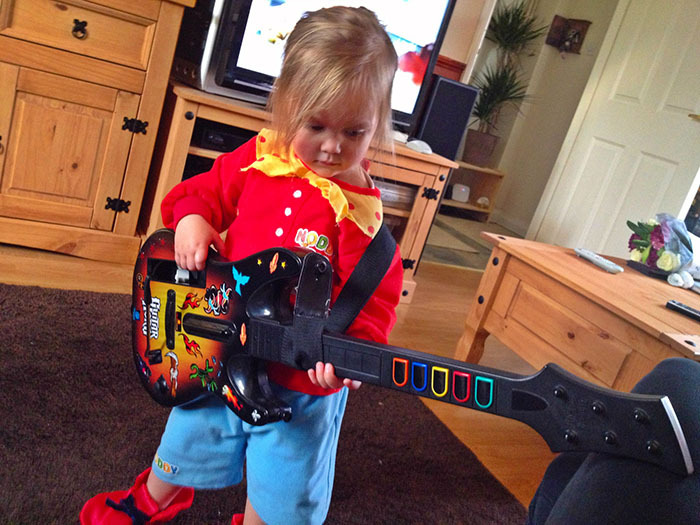 One thing is for sure though, I was definitely not as cool as this when I was a little girl!